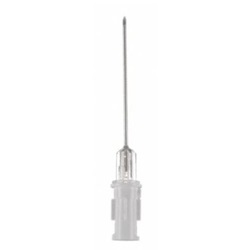 19 gauge, sterile Filter-Needle sterile medication transfer needle measuring 1.5". Stainless steel needle, thin wall, and 5 micron filter. Female luer locking connection. Comes in a box of 100. Manufactured by B. Braun.